Have you recently had dental implants placed? It’s an exciting new time in your life – you’re finally able to enjoy all the foods you’ve been missing, all the smiles you’ve been afraid to show, and caring for your teeth is easier than it has been in years. We’re thrilled to see the implant results we give the patients at our Carmel office, but placing and restoring implants isn’t the end of the process. Once implants are healed and topped with a bridge or crown there’s some special care that has to be taken to ensure that they stay healthy. While implants aren’t difficult to keep healthy there are still some specifics of caring for them that’s different than a regular tooth. 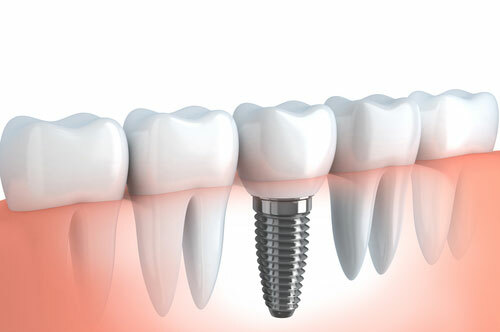 It’s obvious how an implant is physically different from a tooth: it’s a titanium screw that attaches to your jaw that’s capped with a crown or bridge. That said, there are a lot of other differences between implants and teeth that go beyond how they’re built. One of the biggest differences between a dental implant and a tooth is how they both connect to the sockets they rest in. Teeth don’t make direct contact with your bone, and instead rely on a strong layer of tissue called the periodontal ligament. The ligament is made up of a bunch of thread-like fibers that bind to small pores in your teeth and bone, holding them firmly in place. The periodontal ligament is also responsible for fighting gum disease and other infections as well. It runs all the way up your tooth to the gumline, and is the reason your gums hold so strongly to your teeth. Now let’s consider dental implants: they don’t have a periodontal ligament at all. In fact, there’s no tissue between the implant and the bone it rests in. Implants are made of titanium because of its unique ability to fuse to bone. Once your implant is healed it will be perfectly integrated with your bone, forming a seal that’s strong enough to outlast almost anything. Implants are strong, but the fact that there’s no periodontal ligament surrounding them poses its own problem: it’s much easier for bacteria to make its way beneath your gumline. The gums still hold onto the implant crown or bridge, but with much less strength than the ligament can provide. The result is a risk for a condition known as peri-implant disease. A healthy implant will easily last you for the rest of your life, but if peri-implant disease strikes that can all change. Similar to gum disease, peri-implant disease happens when oral bacteria gets under your gums, causing inflammation, bleeding, redness, sensitivity, and gum recession. Since your gums aren’t bonded as firmly to your implant they recede faster, and without any other soft tissue to fight the infection it can quickly attack bone. The end result of peri-implant disease is infection, death of gum tissue, destruction of bone, and loss of implants. When an implant is lost to peri-implant disease it’s not as simple as placing a new one: the bone that held it is either severely damaged or is gone completely. There are surgical options for regrowing lost bone tissue, but we never want to let things go that far, especially when you consider how easy it is to prevent that kind of damage! As we mentioned above, caring for dental implants is a lot like caring for natural teeth. If your oral hygiene habits are good you probably never even need to worry about developing it! Make sure you’re brushing twice a day with a soft bristled brush. Use a toothpaste that helps fight bacteria and be sure to get all around the gumline of your implant. Floss every night – no exceptions. It only takes oral bacteria about 24 hours to start causing irritation to your gums, and it doesn’t take much longer for it to get below them and start spreading. Make sure you’re seeing us at Really Smile Dentistry for regular checkups. Even if you don’t have a single natural tooth left we still need to take care of your implants! Having dental implants placed is an investment, both financially and for your personal happiness. Don’t let something simple like a lack of proper care leave you at a loss. Take care of your implants and they’ll take care of you right back. Call our Carmel office to schedule an appointment at 317-451-4050. You can also save some time and request an appointment online. We look forward to seeing you soon!